It is at times like this that we find it so very hard to say goodbye to such wonderful old timers! Opal came into kennel some 20 years ago and she was tried in a home along with her mother Gem who had been brought in with her but it did not work out - read the Opal & Gem story on our website as these 2 were quite a pair of monkeys! Opal passing was quick and although she was old, we never expected it as she always acted like a pup! That is my part in this over... Opal was most certainly Karens girl and was her last remaining girl from Brackenholme in Selby. Karen will do a write up about Opal but for all those who sponsored her over the years, we and Opal thank you from the bottom of our hearts. Ruth and Lesley are 2 of our trustees. They have 2 of our dogs, Harry and Jade. We were did Heckington Show end of July 2016 with Myself, Ruth, Lesley and Christine and of course Snowie, Bonnie and Max. We had a lot of fun over the couple of days we did it although stressful! Especially putting up a gazebo, where Ruth and Lesley were laid underneath it flat on the floor with the roof on their heads at one point. I don’t think we were understanding the instructions very well! After the rest of the showground had been in stitches for about half an hour a couple came to our rescue and up it went! We were situated in front of a cancer stall and whilst talking to Christine she said, I think it’s 1 in 4 that gets cancer and there’s 4 of us here! It’s terrible really isn’t it? We carried on and had a good time Ruth, Lesley and Christine were all amazing as were all the dogs. The show came to a close and we all got back to our own ways of life! A week went by and Ruth called and we were chatting about the show and I said to her. Are you ok? You sound a bit rough…as I would! She replied with she had had a bit of an accident on her pushbike. She lives in Salford and she had got the front tyre stuck in the tram line and gone come off and bumped her head. I said to her she should maybe get it checked out and she said she would if it didn’t get any better and we thought no more of it. The next day we got a call to say that she was in hospital and not to worry but she had had and ct and mri scan and that she had a brain tumour. But this was not as a result of the accident, it had been growing some time and it was just lucky in one sense that she had the accident to find this! 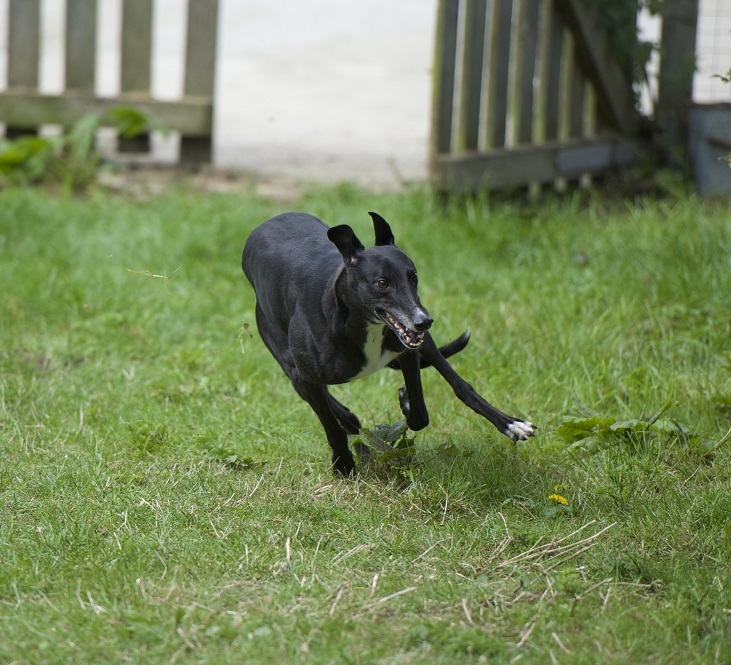 In October 2014 after suddenly losing our old greyhounds, Harry & Jade came into our lives. Two very bouncy, happy loving youngsters & boy did we feel the difference! Fast forward 2 years to August 2016, & I had a minor accident where I fell off my pushbike. I got low grade concussion & was diagnosed with a high grade brain tumour. Surgery & radiotherapy followed. The dogs kept me going, they & my wife were amazing. As soon as I could walk, I was back out every day with them getting some fresh air. They made me recover quicker & I owe my fitness & health to them. At the end of February 2017, whilst on a trip to Bristol, the dogs stayed with my parents. Upon our return, Harry had a small lump on his bum, mum & dad had seen this & taken him to the vets whilst we were away as they were worried. We kept an eye on this for around 6 weeks or so, taking him back & forth to our vets, trying various tablets, until in April the vet told us that my gorgeous blue boy had cancer too. This was heart wrenching. I love my pup so much & the thought that I might lose him was shocking. The vet diagnosed him with a mast cell tumour which reacted to histamine, hence why it had been so reactive to all the medications that he had been given. When initially found, it had been around a 2cm lump, increasing to a 15-20 cm lump before it was removed. On the 21st of April Harry went in for surgery. We had been told that it would be a lengthy procedure & after 6 hours of not hearing anything, I phoned the vets. I was told that the vet was just finishing with the surgery & that it had been much more complex than expected. I went over to see him that evening & the poor boy didn’t know me. I asked if they would keep him in overnight as I knew that we couldn’t care for him as he needed at that time. He wasn’t able to stand, he was so weak, it was so painful to see. The following day, we went over to Sheffield to collect a dog on behalf of Greyhound Rescue, then took him to his new home. It was heart warming seeing a new partnership of dog & ‘new mummy’ & made us both realise how much Harry means to us. That afternoon we both went to see Harry at the vets & found him extremely lethargic still & not in a good way. The vet said that he had lost a lot of blood during surgery & they hadn’t known if he would pull through the first night or not. On the 23rd we brought him home with the instruction to keep him quiet & return him for a follow up check in 2 days time. We took him back & he was starting to heal well. The vet was pleased, cleaned & changed his dressing & asked us to come back in a couple of days for his next check up. We were changing his dressing daily ourselves & the day after the visit, when we checked his wound, a large part of the skin graft had died. We rushed him over to the emergency vets & the dead skin was cut off, the wound was cleaned but it had left a gap of around 20cm by 10cm of open skin. The vet who cleaned the wound wasn’t hopeful that it would heal and left us feeling very deflated. The following week Harry was back at the vets having emergency surgery, our amazing vet had a pioneering new surgery which would stretch some of the healthy skin over the wound to reduce the size of it, allowing a smaller open wound to have the best possible chance of healing. He recovered from this surgery much quicker although he still required the wound dressing daily and twice weekly visits to our vets in Leeds (from Manchester where we live). These continued for the following 6 months to allow for regular dressing changes & cleaning, as well as laser treatment to assist with speeding up the healing of the wound. By the start of June, his wound had healed enough that we were able to start him on chemo. Following the histology results, it was revealed that he had a grade 3 tumour however the lab were unsure whether full clearance had been taken or not, therefore the vet wanted to start him on Palladia. Knowing how I was feeling taking chemotherapy, I worried how Harry would be. I was having chemo every 6 weeks & it was taking it out of me for between 5-10 days each time & my poor pup was going to be on it every other day. The vet explained that dog chemo is very different to human chemo & that he would be unlikely to have any side effects. I couldn’t believe that both of us had had cancer, & were now on chemo together. Everyone was joking that he was doing it out of sympathy for me, but I do believe that we are so close that somehow, his tumour came out whilst he knew I was in treatment for mine. We are both now in remission. Harry has had blood tests & is fully clear after 6 months of chemo, I had 8 months in total & we are both well. We both have our scars but they don’t stop us getting on with our lives. He is still my beautiful blue pup, just with a slightly patchwork bottom!! Freya raised such a lot of funds for the recuse in her life here for all her friends and her life was cut short with a sudden illness. She was such a popular girl and loved everyone who walked through the doors! I don't think I have known one person who didn't want to take Freya home! Unfortunately, she wasn't a dog that could be re-homed although we did try. And her adopted owners who did try and try with her, and who were devasted when she had to come back here, are coming on the walk with us. They always loved Freya. They will be there with Chalky and Xena and I am sure it will be a difficult one for them too. This walk we are hoping to do each year as Freya was imported in the face of the rescue as was Duke. We would also like this to be a walk to remember all the ones we have all lost and let them all know this is their day. So come on and join us - it is a sponsored walk but if you cannot get sponsors - that is ok - we have a charity tin there on the day - we can just get people to drop a donation in! Let her Legacy live on. CAR PARKS: There are two car parks free for the first two hours: Dambusters Memorial, Royal Square (Station Road) and one near the Police Station also on Station Road (B1191). 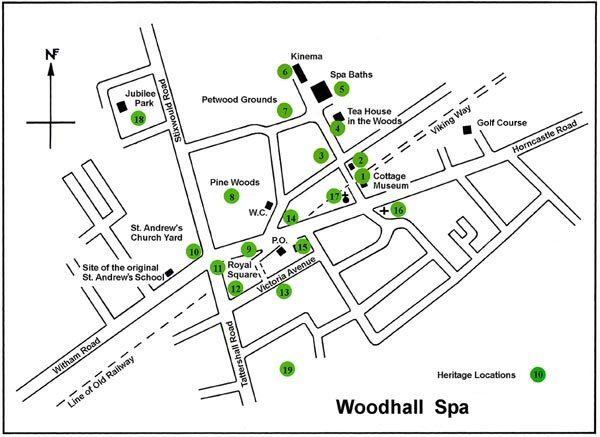 MEETING POINT: By the Pinewoods Walk trail map to the right of public toilets (black and white building) on Spa Road. 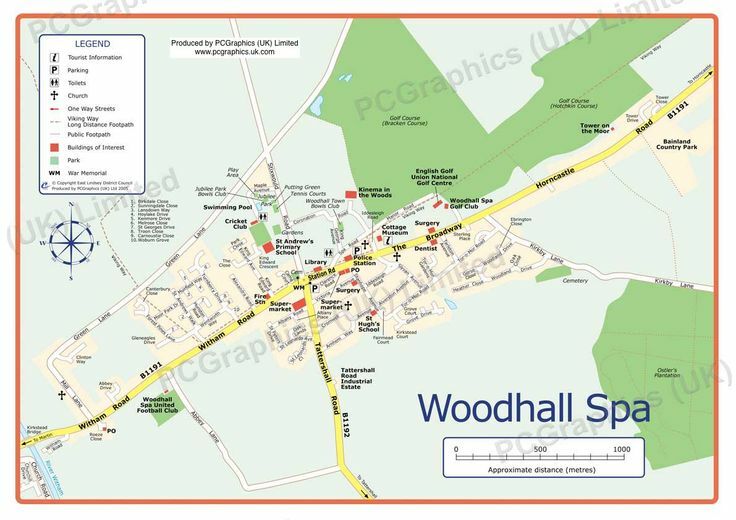 Please be aware that the Pinewoods Walk is surrounded residential roads with passing traffic so please keep dogs safe. Please also pick up after your dog(s). Thank you. Enjoy the walk in this pleasant shaded woodland with avenues of diverse trees. 1. With the public toilets (black and white building) behind you and the wood in front of you, turn left and walk along footpath with the woodland on the right. You are now passing the back of the parade of shops on your left. 2. At the Woodland Trust signpost (“What will your legacy be?”) take the footpath to the right. 3. At the crossing of the footpath with the post with the carved image of a face (the green man) on your right, take the track to the left. 4. At the end of the track and on meeting the crossing of the footpaths take the footpath to the right. 5. Continue straight on, passing wooden post way mark with carved pine cone on it on the right and keep straight on. 6. At the next crossing of footpaths (“crossroads”) with the Holly tree on the opposite left corner, take the footpath to the right with silver barked trees on either side of the path. 7. At the next crossing of footpaths (“crossroads”) with the large Oak tree on the right, continue straight ahead, continuing on the righthand footpath. 8. Continue to the right, walk to the right of the fallen tree and keep straight ahead. 9. Follow the footpath straight on, passing the bench on the right. 10. Take the footpath to the left. 11. At the junction of footpaths, take righthand fork. 12. At the next “T junction” of footpaths, take the righthand footpath. 13. Emerge from the woods with the public toilets on the right with Spa Road behind them. At this point, with public toilets behind you, turn left and walk along footpath with woodland on your right and back of shops on your left. On Sunday 11th March 2018 Deacon went out fundraising with his new dad Tom, uncle Del and Karen & myself to Pets At Home in Boston with whom we are partnered with. We all had a good day and Deacon enjoyed being pampered and cuddled and just adored by all. Nothing fazed him at all! He walked around the store had a look at the rabbits, mice, rats, hamsters! Not a bother from him! Wasn't remotely interested in anything but a cuddle. Such a funny kind soul he is. Looking stunning in his show coat made by Karen. H was more than happy to strut his stuff in it! He had his toy duck & chicken on his head and not a reaction from him! He is such a calm boy but then always has been. They are all different. Deacon had a few small dogs come up and bark in his face and his reaction was to ignore them. Other he kissed! He was excellent. As was Bob the previous time. 2 Great fundraisers though very different dogs. Well done to all, Tom, and Del, thank you so very much, we really appreciate ti and to Deacon, you are the star of the show as always! Karen really enjoyed it too as did I. Thank you to Pets At Home Boston again. I am so sad that you had to leave us. I followed one step behind you on my first Great Global Greyhound Walk and I felt safe with you. You showed me that there is a much better life after the Race Track, and you gave me the confidence to go out and enjoy my new life adventure. I will never forget you, Boris. Run free with the wind in your face and the sun on your back. Although Boris did not come from our rescue, he became special in our hearts not just because he was such a stunning beautiful greyhound but he was the reason Lola is with her mum Susan. Susan contacted us after meeting Boris shortly after moving into her property and asked us if she could adopt 'Bonnie'. At the time, Bonnie was not ready for adoption having just lost her kennel mate Harry and being comforted and possibly being re-homed with a male. So we had just got a very young gorgeous girl in called Lola, who we were going to keep for fundraising - we knew she was very special. However, Karen decided Susan was the perfect home for Lola and so off she went, and within a couple of weeks, Lola met Boris and the 'love affair' began. She adored him. We as humans do not always appreciate how close these dogs become and what an affect losing a mate has on another - even if they do not live together. Well done Boris for showing Lola the strength she now has and for showing Susan that Greyhounds make the perfect pets! You will be sadly missed by all that knew and loved you and by those who knew of you. Keep on doing what you do best Lola with your mum - just what Boris showed you and teach all the other new ones the way. You arrived at this rescue as a shy frightened little girl, not yet being 2 years old, so young to have suffered the cruelty you had known. As your time went by with us, you became less afraid and accepted the feeling of safety and you knew that we loved you and were here for you, to help you forget your past of human betrayal. Your chance came, the chance of being a much loved family pet with 2 lovely people, whom fell in love with you (as many did), despite all they could do to show you, you were safe and cared for, you chose to come back to the kennels. And here you became so happy and playful, you’d found the place you wanted to be, with us and all the other dogs. A place you were in your own happiness and contented with your life, with your friends, your toys, your warm bed and two human hearts that found you such a beautiful treasured little creature. At the age of nine and very unexpectedly you fell silently asleep, and left us in such a state of desperate sadness and with such a deep feeling of loss and emptiness. Our dear Freya, you will always be remembered as our playful, gentle girl, who found a safe place to be happy, who made such an impact on so many people. Your exit from this life has broken the many hearts that met you, and I know two hearts will always carry a piece of you forever. Lastly, myself and Dawn would like to say to all the kind people that have sponsored Freya, a big heart felt Thank you, for caring enough to sponsor her, because all these dogs need help and without people like yourselves our job would be so difficult to give each individual dog the care they need. Born in the rescue, Solo, from the minute of opening your eyes you were determined to live a ‘life of mischief and naughtiness’. Such a bundle of dynamite waiting on the line to explode at any second. What a song and dance you led us whenever you could grab the opportunity. You had to be separated from your siblings at a very early age, as you’d never let them sleep! You lived your life with your mum, the only dog that could ever keep you in check, and sometimes that was quite a task. Up and down and round and round the kennels you’d go, if you didn’t want to go into your bed, it was a real run-around. You had a mind of your own and did exactly what you wanted. What a funny girl you were. We never expected you to fall into such a terrible illness, an illness that took our mischievous girl Solo away from us. The girl that with her funny stubbornness and strong mind of her own, it turned you into a quiet and fragile lady who needed lots of cuddles and reassuring words. Words with the hope that you would beat your illness, but we knew the odds were against you. Solo, you wagged your tail when you had your visit from the best vet you could possibly have. You never complained with you blood test, and we had hope. Two weeks down the line, suddenly within hours, that hope was taken and you passed away in your bed with your mum beside you. Yes you made sure that you saw Dawn and myself before you quietly left us. There will never be another you, there’s mischief and naughtiness in everyone’s and everything’s heart and you had a big piece in yours. You will be remembered for your character and always remembered with love. I had been living in a small apartment for seven years and it nearly drove me mad! Now at last I had moved into a small bungalow with a garden and nearby woods and parks to explore. One day I met a lady walking three greyhounds and I was charmed by her calm and friendly manner,and captivated by the hounds. They stood quietly as we chatted and I wanted to know more about the breed. These were rescued hounds and Deborah told me a little of their individual stories and explained her role as foster Mum, and how she socialised the dogs and taught them how to live happily as part of a family unit, so that they could be rehomed. One of the dogs was Boris, a tall, regal looking Fella, blue in colour, who responded to my chatting to him by looking into my face and listening intently. Of course I fell in love with him immediately! Over the next couple of years I was busy renovating my new home and garden but could not forget Boris, who I would see from time to time as he had now been adopted by Deborah and was a permanent member of her family. I began to consider rehoming a greyhound. After alI I reasoned, I needed a big dog to protect me in those woods and parks which I now had time to explore, but what I really wanted more than anything else was a gentle loving companion who would enjoy exploring with me at a calm, leisurely pace. I went online and found a sweet female greyhound, Bonnie, a Blue just like Boris, but smaller. I made enquiries, but eventually it was decided that I was not the right Mum for her because of my particular circumstances. 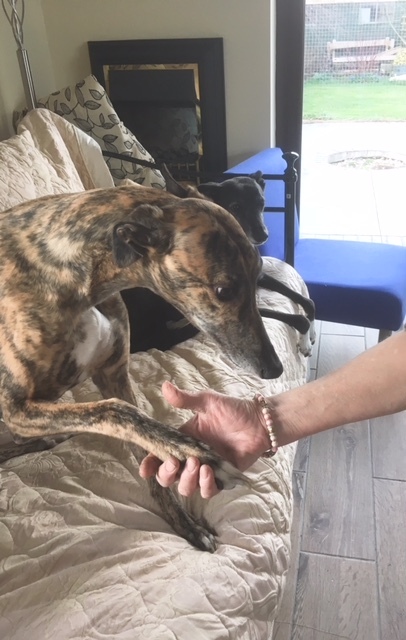 I was disappointed but persuaded to consider a little black ex-racer who had just arrived, and Karen thought Lola might be more suitable for me as my first greyhound. Lola arrived with Dawn and Christine, very bright and inquisitive and seemed confident enough to be left with me. As they drove away we watched from the window and Lola was trembling but never made a sound. We started to get to know each other and Lola was very biddable and enjoyed a short walk around the block, looking very interested in her new neighbourhood. Bedtime came and Lola was very scared by being in a room alone, and strange sounds of owls, foxes, deer and nearby human neighbours. I kept going in to reassure her and eventually she fell asleep exhausted. Next morning she was happy to see me and accepted that for the time being at any rate, I was to be her human carer.She soon understood the new routine and became eager to please me, and yes, she did enjoy exploring with me. Our walks gradually became longer and more varied. One place fascinated her. High up in the woods was a place that overlooked a low light coloured building with lots of cars and people going in and out, a supermarket. It dawned on me that she was wondering if this was a stadium where all the other hounds were, and she was missing them! A few days later I saw Deborah going past our house with Boris and Lottie and I asked her to wait as I ran in to fetch Lola. I will never forget the look of sheer relief on Lola's face as she saw the two greyhounds, who stood so sedately and calmly, and then gently and sensitively greeted her. From that moment on Lola completely accepted her new life. Each time we saw them she politely greeted Lottie and resolutely gazed adoringly at Boris. On her first sighthound group walk she followed one step behind Boris all the way. Lola was in love. Boris was a little aloof as he was much older and used to female greyhound company. Lola was gentle but persistent in her attentions and slowly Boris began to show more interest in her, until one day he kissed her and she was ecstatic. Soon after this Lola was astounded when a female greyhound pup appeared with Boris and Lottie. Lola was not spayed and she suddenly knew what she wanted. Lola came in season twice after that and showed signs of a phantom pregnancy. She had been ill but was eventually able to be spayed and doesn't pine for pups any more. She continues to adore Boris and he is rather fond of her too. When they meet Lola usually ends up leaning her chin on his back, and Boris seems to enjoy her hero worship. As for me, well I still love Boris almost as much as Lola does, and he still looks at me intently as I chat to him even though he is now deaf in one ear, just like me. Unicorn Head Shave & Leg waxing Fundraiser! We did it!!! So here is the proof!! On 26th November as promised, much to my mothers disgrace, I braved the shave for the greyhounds!....and 2 lovely guys, James and Andy braved ...well, screamed their way through their legs waxed! We could not have done any of this without firstly, the amazing lady behind Greyhound Rescue, who throughout the years has kept this place going and fought since the late 80's for the welfare of this wonderful breed, Karen Schultz. Karen has over the last year been battling a devastating illness and is now in constant pain and although she is a private person, I feel it is time to say what an incredible inspiration she is and the way she still carries on even though she finds it difficult to stand up for more than a few minutes at a time....she still against all advise, will not stop and will not let her animals down....and trust me, nobody can tell her what to do! The other 2 people we could not have done this without are 2 special people who gave up their Sunday and their skills to help us. Tiffany Day who owns Spoils Beauty Salon, in Boston, Lincolnshire, who did the leg waxing and must say - Tiffany rather enjoyed it if you watch her face! Poor James and Andy! I do feel she was getting some kind of inner frustration out but she gave us quite a laugh! We will be putting all the details of 'Spoils Beauty Salon' on our website for anyone who wants to get on touch with Tiffany, we fully recommend her! She has a range of beauty treatments. Hayley Martin, the hairdresser, was more nervous than me at me having all my 'long hair' shaved off! I think I was just thinking of the dogs...since though I must say, I have been thinking how cold it is and have slept in my hat for nearly 2 weeks! Hayley, who is self employed and works mobile one day a week and then based at Flinders Salon in Boston, Lincolnshire. Hayley has been in hairdressing for 20 years and fully qualified for 16 years. Highly recommended too, she is an excellent hairdresser and I wouldn't hesitate in putting anyone in tough with either of these 2 lovely ladies. Both so good at what they do as well as being extremely good sports and having the kindest hearts to help animals. Nobody can argue with that! Thank you to James and Andy for your amazing screams and the laughter you created! That was the most fun for us personally....even Bobby the greyhound was laughing at you both (and Andy's his dad)! So far we have raised nearly £1300 and the crowdfunding page is still open for about 3 more days - we also have a paypal donate button on the website here if anyone does still want to donate once they see what we have done. Every little bit really does help and we are so very grateful to all that have donated so far. You have all made a big difference. We thank you all. You can also send cheques made payable to 'Greyhound Rescue' and send to Greyhound Rescue, Crimea Cottage, Sutterton Drove, Amber Hill, Boston, Lincs, PE20 3RP. Please note that the 'phonecall to my mum was a shock for her and she is still very mad at me' that maybe worth a donation in itself as she was fuming I was having my beautiful long hair shaved off!!!! And she is going to be more fuming that I have outed her call online!!! As I am only 48 and 'not to old for a clip around the ear'! I am shaving my head on the 26th November 2017 in aid of Greyhound Rescue Charity No 702522. Where horses and Cats are also rescued too! The head shaving will be 'with a difference'! I will be made to look like a 'Unicorn' with a 'Q' in the back of my head in honour of one of the horses here who has had (& is still having) a 2 year battle with laminitis. The funds we raise are for the greyhounds in our care, for food, vets bills & ongoing care & support as we are struggling. For over 38 years this rescue has cared for & rehomed so many greyhounds & saved so many from such a horrible outcome, after all, they have given their all to the greyhound industry..Yet now many are being exported to China for the meat trade & Spain/Pakistan after their careers end here and in Ireland, all for a terrible end. We need to raise more awareness and help get more through the rescue to help stop this shocking abuse. I have lovely long hair now and my mum id going to go mad with me so if you all want to see my mums reaction too....you know what to do!!! Just a little donation! It all helps! The founder of the rescue & the kindest person I know is unwell now too & we need all the help we can get to continue to support her & her legacy- Greyhound Rescue' Looking A Fool For Karen & The Animals! Please help me by making me look a fool - dawn - the unicorn! Please copy & Paste the link below into your search to donate whatever you can to help Dawn reach her target! Or you can donate through our paypal donate button on our website or send a cheque made payable to 'Greyhound Rescue' and address is: Crimea Cottage, Sutterton Drove, Amber Hill, Boston, Lincolnshire, PE20 3RP. Owners have raced greyhounds for many years and people see them muzzled, chasing a make believe hare. The public gain a lot of excitement from the spectacle and gamble thousands of pounds on their performance. When they have finished their usual track life, either because they are too old, injured, or just not fast enough, they are disposed of. The lucky ones end up in Greyhound Rescue for re-homing as family pets. The problem they then have is overcoming the public's image of the breed. It is generally thought that they need to be kept muzzled, are dangerous around children and need lots of exercise. As with all breeds each greyhound has it's own temperament but in general greyhounds are extremely lazy, spending most of their time either flat on their backs, with their legs in the air, or sprawled out in their bed fast asleep. Most only need two walks a day and the freedom of an enclosed back garden. They love a cuddle and in particular like their bellies rubbed. A greyhound sees a lot further than a human being and if they see something in the distance they will set off to chase it, so the should be kept on a lead at all times when walking them, but they saunter along at a gentle pace, giving the owners a steady walk. In general a Greyhound is one of the most loving pets to own and will give many years of love and friendship to it's lucky owner. Ooops! Accidents In The House! Many of our owners have contacted us with various problems that they have had with their dogs over the years, but one of the most common of these problems is 'Accidents in the House'. If this problem is going to arise, it is usually within the first few months, whilst the dog is adapting to its new home environment. Most adopted greyhounds are usually very clean in the home,as they were in their kennel, but there are always exceptions to the rules. As nearly all rescued greyhound have lived in kennels for all of their lives, a home can be a very strange experience for them, as well as also experiencing human company around them all of the time. One of the main causes of 'weeing' in the home is leaving them on their own after spending long periods of time with them. The dog can become very upset because you have left them, and not know whether you will be coming back to them. Greyhounds that have spent the past four or more years of their life in kennels, and then find an adoptive home, bond very quickly with their new owners and soon get used to people being around them all of the time. You have to remember that when greyhound are at racing kennels they receive very little in human company. So when an owner either goes back to work after their holidays, illness, weekends, school holidays etc.. they tend to take this departure very badly and start getting upset. This stress can then cause them to 'wee' in the house. We all know that the last thing that you want is to come back to when you have been out, are puddles on your best carpet, but you will usually find that they have done it for a reason, not just to annoy us. Always let them out first thing in a morning and last thing at night. Give them a walk at least once or twice a day if possible. When you leave them, try not to shut them in one room, if you do, try a baby gate in the doorway instead of shutting the door, it can make them feel more secure when they can see what is going on around them. Try not to tell them off! Especially if you did not see them do it, they will not know what you are talking about, and some dogs can actually do it for attention whether positive or negative. Instead of spending money on expensive ' Pet Accidents' cleaners, use a biological washing powder in warm water. The enzymes in the wash-powder will break down the smell and the stain, always do a test area on your carpet first though. In most cases, the dog is usually adapts quickly to its new home and life, but on occasions, you may still have an odd accident. If this happens, try to think if anything has happened during the day that may have caused them to do it. Many times in these cases though is has genuinely been an accident, and they have not been able to wait to go out. They are no longer satisfied with the things that you gave them anymore, they now want the kids toys to play with, your best coat to lay on and will not eat anything unless you go down to the shop and by them sirloin steak that they like so much! and if you are going to cause any waves and not let them do these things, then cry, bark or even growl at you until you let them. It does make a funny photograph when you dog is surrounded by ripped up cushions and there are feathers and stuffing hanging out of their mouth, because they have been allowed to take control of the house and they are now in charge! If they are allowed to do as they like from the start things can only get worse. Ben used to be a fine example of this, he is now in a new home for the third time due to his behaviour in previous homes,and all of it was not his fault. It all came down to when he was first re-homed, and being totally spoilt rotten, no ground rules set and allowed to please himself, to which he took complete advantage of . He has been at his new home for over a year, with no problems at all, as he was given ground rules from the begining. Basically they are only like children, allow them to run riot and they will, and they will throw a paddy if they cannot have what they want. Set the rules from day one, give them as much love and affection as you want but just do not spoil them too much or you will be paying the price later on - or the dog will!! Another example of being spoilt is my own greyhound Bobby, as many of our owners will know, he is a lovely dog and we would not be without him, but he is a spoilt brat! and I know that we have made him this way. He stamps his feet when he does not get what he wants, he steels food off your plate, while you are still eating it! he takes everything that does not belong to him and nothing will stop him from barking if he wants to go for a walk, but he is nearly 11 years old now and set in in ways. It's amazing how I can give out advice to other people, but do not take my own advice!! But she's so pretty we forgive her?????!!!!!!! I was bred in Ireland then shipped across the sea to England when I was about 13 months old where my career as a racing greyhound began. Along with my littermates we were sold and split up. Going our separate ways, I did not know what lay ahead. On arrival into what was to be my racing kennels, I was just a little nervous, the place was busy and noisy. Put on the track to trial in with many others of my kind, I did quite well, I was in the business of earning my owner and trainer money and of course my keep. I made many friends with the other greyhounds but knew there was something not quite right. Some nights when my pals went racing, some of them never returned to the kennels. Old faces I'd known kept disappearing, I did not understand. Then one night while I was racing there was such a pile up on the bend: three of us were injured, I being one. I heard men's voices, he's no good now, you can take him up to the Northeast or too the Sanctuary in the West, they will kill him for £10. I then realised why my kennel mates had been disappearing. Unfortunately I never saw one of the injured dogs again but I was lucky enough to have a decent owner, who took the trouble of finding me a safe house and that was at Greyhound Rescue. I've been taken care of here, my fear of the unknown has gone, everyone is kind to us and we even get a hug etc. There are what (if I may be so bold) some very old timers here, they will never disappear. I've been told many a time, that when I leave the rescue I will go with good, kind people who will take care of me, love me and be patient while I settle in to what humans call having a family. If I had a family, I would pay them back 10 times over for all the love they gave me. Along with many of my pals, I'm waiting patiently for a home, somewhere I can rest and play and wag my tail without fear. Please, Please can you help myself and others to find a place into your home, family and hearts? We have so much to give if only given the chance. Rose had been living with us for a few months, had settled in nicely, and made friends with her new boyfriend Honcho. It was time to get Rose spayed, otherwise we could be in for trouble. We had already become very attached to Rose, as she is particularly affectionate and 'cuddly'. On Friday morning I drove Rose to the Vet, Anna, who is my sister. Rose had a quick examination - all seemed well. Anna asked if I would like pre-anaesthetic blood tests, and advised that these are usually unnecessary and would not be a normal procedure in a dog of Rose's age ( Rose had just turned 3). She has a young greyhound as well, and she said that she wouldn't bother doing them for him - the risks are very small, so I ticked the "no" box without a second thought. I picked Rose up that evening, and she was obviously tired and sore, which we expected. Over the weekend, Rose refused to eat anything at all, and kept vomiting. I spoke to Anna, who seemed concerned - she expected Rose to be doing much better by Sunday. On Sunday afternoon we took Rose to the surgery, where Anna examined her. Rose could have been having an allergic reaction to the suture material used. The only other explanation was that a swab had somehow been left in the abdomen, and Anna was 100% sure that this was not the case. We believed her, of course, I know that she had given Rose the best possible attention in her operation. Rose was given some injections, and she came home, where we monitored her carefully. Monday morning came, and Rose still would not eat. She was still being sick regularly despite not having eaten at all. She seemed unsteady and refused to lie down. I had to go to work, so I persuaded my mum to take Rose to see Anna. Anna examined Rose again, and gave her some more injections to stop her being sick. She kept Rose at the surgery to monitor her. Rose spent monday night on Anna's bed with her, as that was the only place she would lie down. On Tuesday, Anna performed more tests on Rose, including ultrasound and blood analysis. She was placed on intravenous fluids and kept in the surgery. We were seriously concerned about Rose's health, and eagerly waited for news, which was a shock when it came. The blood tests showed extremely high levels of urea and creatinine in Rose's blood - indicators of severe kidney failure. Anna believed that Rose must have had kidney problems since birth, and the anaesthetic had triggered a massive failure. We were all shocked as this was the last thing we expected in a dog of Rose's age. The prognosis was not good, as signs of kidney failure only occur once 70% of the kidney is failing. We were to expect the worse, and the possibility of a tough decision to make. Throughout the week Rose was kept on a drip to flush the toxins out of her and give her Kidneys a chance to start working, and she slept in the surgery at night. We went to see her every day and took her out for a walk. Although she was pleased to see us, we could tell she was unhappy. We encouraged her to eat ( which she refused to do). Anna and Fiona the veterinary nurse visited her every night to change her drip. By the weekend, Rose had lost nearly 5kg and was incredibly thin, but she started to eat a little food. We persuaded Anna's boss to let us keep Rose in over the weekend, and keep up the treatment. We knew that he did not think Rose would make it - he hadn't seen enough of an improvement, and we appreciated the fact that George and Anna were being honest about her chances, and were not giving us false hope. We all wanted to prove that we were doing the right thing. We knew things were getting better, albeit slowly. By Sunday, Rose was much brighter and had started to eat more. Her blood samples were still very high, but had improved slightly. We took Rose home, and she was placed on a special diet and medication. Over the next few weeks Rose put her weight back on, and gradually returned to her normal silly self. She has had several blood tests since, and these have shown a huge improvement, almost returning to normal values. We hope the improvement will continue. Although we don't know the long term prognosis for Rose, the signs are good and we know we made the right decision to keep fighting for her, when most vets would have advised to stop the treatment. There are two lessons in this story: Karen told me that greyhounds are fighters, and she is right. Rose wanted to keep going and we just needed to help her through it, so do not give up on them, or let your vet give up on them too soon.The second lesson is to think very carefully about pre-anaesthetic blood tests before placing you dog under general anaesthetic - regardless of the dog's age. Throughout Rose's treatment we had fantastic support from Karen at Greyhound Rescue, who I spoke to nearly every day. Anna, Fiona,George and all the nurses at Avalon Veterinary Clinic in Glasgow were brilliant. I want to thank these people for their support, and their belief in Rose. Without them, it is likely that she would not be with us now. We first met Karen and Dawn when we were looking for a 3rd dog! We had sadly lost our 13 year old rescue lurcher Poppy in the March 2014. We already had a 6 year old german shepherd called Jackson and a 7 year old rescue greyhound called Susie but felt we had become a '3 dog' family! 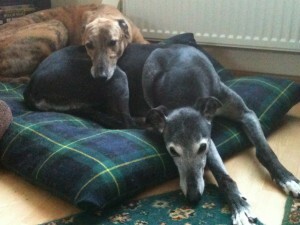 We felt we had it in our hearts to rescue Connie a 14 year old greyhound who had been massively overlooked. We were told that Connie had lived in rescue nearly all her life but was not good with other dogs sadly. Karen asked us if we would consider a 5 month old greyhound cross called Bambi? Very different to an old greyhound! Bambi was still living with her owner but was being put up for adoption as the owners child had an allergy to her! Sadly she was living in a crate most of the day! We decided to give her a chance as we thought a puppy would be very popular but would bounce straight back to rescue. Bambi lived 2 hours from us so we met the owner halfway. Bambi was so gorgeous and so friendly. All the way home she sat on my knee looking into my eyes and looked so worried. We got her home and introduced her to Susie who was not bothered at all. Jackson our shepherd was not too happy and kept barking at her and eyeballing her! It took 2 days for Bambi and Jackson to become mates. Jackson would sit with all his toys to play with her! These 2 are still great mates 2 years on! Susie gets off the sofa every now and then to calm the play down. She stands between them and barks to tell them off, its so funny. We feel Bambi found us really as she reminds us of our beautiful Poppy but lighter in colour as Poppy was black. She is a lovely girl and love her so much! Karen and Dawn are still in touch with us nearly 2 years down the line. We took Bambi on the 2 hour journey to see them as Bambi came directly from her owner but passed through their rescue. I try and call them when I have a minute which is not often as I run a very busy dog walking business as well as having 3 dogs of our own! These are 2 amazing selfless ladies doing an amazing job well done to you both! We really appreciate with such heart felt emotion the lengths Mel and Tim went to for Bambi. She was in a very difficult situation that needed sorting out very urgently and even though these 2 wonderful people had their hearts set on our beautiful Connie (who has sadly now passed away), they didn't hesitate in making their selfless decision to help another dog in destress....even though she was only a pup and we all know a pup is not an easy task to take on. We cannot thank you enough. Also, Mel and Tim have been continued supporters of Greyhound rescue since our first contact, collecting items to sell and donating monies towards the greyhounds in our care.